Return of the Ransomware has begun. CryptoLocker has sprung up a botnet of servers to spread the virus, but were soon seized by the FBI after a few hundred thousand English speaking users were infected. That does not mean you should forget about it since the developers will find new ways to spread it, if you do not have it already. So keep your anitvirus and antimalware updated! Once you get the infection, it takes roughly 72 hours to complete its duty, then it interrupts your workflow with prompts, ads, notification and changes your background, then asks you to pay to fix what they have broken, technically what they encrypted. CryptoLocker targets all your document files, like Word, Excel, PowerPoint, and encrypts them so you cannot open it. The first one we found we tried all our tools from Malwarebytes Antimalware and Combofix to Trend Micro and Offline Windows Defender. While there are several tools that can remove the CryptoLocker virus, there is no way to undo their nasty 256-bit encryption–besides sending your money to the virus developers in the form of bit coins (which can be used for many illegal things like in the black market). There is hope, however. The virus does not seem to target network files yet, so if you save files to a server, you might be in luck. But, there is no telling when the virus will evolve start targeting remote file systems. The best way to prevent this is to take backups of your data, then take offsite backups, then take backups of your offsite backups..offsite. We offer a comprehensive backup solution. For more information and a fancy video, click here. There was recently news of a vulnerability in every version of Microsoft’s browser that could Allow Remote Code Execution. Microsoft has released a patch for all versions of Microsoft Internet Explorer from IE 6 to 11 — YES! That means XP is still getting a patch for this. BUT, this does not mean that you can go to any site and expect to be protected. You still need to practice caution when viewing new or questionable sites. The update is available now; So if you are not set for automatic updates or your company has to approve the updates on the server, get that fixed! If you cannot get the latest patch, we recommend using an alternative browser like Chrome, Firefox, Opera, or Safari. Your business has taken off and is doing well. Your employees have been operating at a peak of efficiency, your quarterly earnings consistently increase, customers are raving about your amazing product or service over social media. Success has already been achieved but for how long? What happens when…the unknown happens? Today we are proud to announce our launch of Vision One Vault, a smarter way to protect from the unknown. With Vision One Vault we can protect you against accidental deletions, power outages, hardware failure, and numerous amounts of natural disasters. In the event of a data failure we will use the power of the Vault to get your company up and running again. Vault will not affect your day to day business. We would like for you think about it as an Invisible Guardian keeping your data safely in our Vault, during down time and between workdays. But no matter what the hour, the Vault is able to restore any time day or night. When you notice a data loss, we will do our best to get you the data you need. Business does not stop when you leave the office and neither should your data. With Vault, you can focus your time on managing your company instead of managing your backups. Our expert team can manage your backups and offer our comprehensive IT services. You can devote your time to the business functions of the company and we can manage your backups, giving you access to your critical data whenever you need it. Microsoft is giving away 100GB of cloud storage! If you haven’t used Windows 8 before, you might not be too familiar with Microsoft’s OneDrive (formerly known as SkyDrive). It’s been around for a while now, but with Windows 8, it was more in your face. Many of the apps from the Microsoft Store can interact with files in your OneDrive, and with 8.1, OneDrive has deep integration with the Windows Explorer. If you have a Windows LIVE account, you already have OneDrive (probably the 7GB they give to everyone for free). If you want more storage, you pay an annual subscription for the amount you need. It’s pretty simple, and not at all expensive (plans from 20GB to 200GB, all for $0.50/GB), but Microsoft is trying to lure in users to search with Bing and use their cloud storage by offering 100GB ($50 value) for free. Let’s not mince words, though. This is not perpetual storage. If you want to keep that 100GB of data in your OneDrive after a year, you will need to fork over $50/year. Also, in order to get it, you need to sign up for Bing Rewards. Bing Rewards is free, and basically pays you to search. There are other actions you can perform for bonus reward points, but the bread and butter of it is that you earn points for searching with Bing. Then you redeem those points for cool stuff like gift cards to Amazon, Gamestop, restaurants, Starbucks, and more, as well as sweepstakes, and various online services. If the idea of dropping $50 next year to keep your cloud storage isn’t a dealbreaker, I highly recommend you clicking the links and taking advantage of the offer while it lasts. 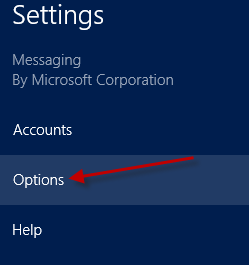 I recently moved to Windows 8 RTM and in an effort to take full advantage of the Windows LIVE integration, I connected my domain user account to my Microsoft account. Doing so automatically signed me into the native Messaging app, and I am not sold on full-screen instant messaging (I’m a strong Trillian supporter actually). Unfortunately, I struggled to find a way to disable the Messaging app without uninstalling it. At first, most people might think that uninstalling an application you don’t use is a reasonable solution, but uninstalling Messaging means uninstalling the Mail, Calendar, and People apps as well. 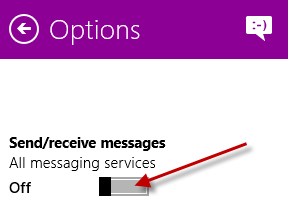 So, I put my thinking cap on and decided there just had to be a way to disable Messaging without uninstalling it. Press CTRL+C, move your cursor to the upper or lower right corner of the screen, or swipe in from the right if you’re luck enough to have a touchscreen. With the bar open, click Settings. Move the slider to Off, then close the app. It is worth noting that you will no longer see the number of unread messages on the lock screen, but if you prefer to use the classic Windows LIVE Messenger, Trillian, or some other IM client, this is probably a worthwhile tradeoff. While many techies were distracted by other events at Mobile World Congress 2012, Microsoft unveiled the Windows 8 Consumer Preview, making it available for public consumption. Okay, okay, you probably already knew that. But did you know that Windows Server 8 “Beta” and Visual Studio 11 Beta (along with Team Foundation Server and Team Explorer Betas) are available for download as well? I’d write more, but I’m too busy getting my hands dirty with these new Microsoft bits. I’ve already installed Windows 8 in a VM, cleanly on a Lenovo ThinkPad W510, and did an upgrade install on a Lenovo ThinkPad T400S. I’ve also installed Windows Server 8 Beta in a VM and Visual Studio 11 Beta once online and once offline. Now it’s time to play! In collaboration with OSYS, we’ve launched our new website (here). Go check it out and let us know what you think :). Also, be sure to check back often for new features and content!